We've previously reviewed several petrol generators from Machine Mart, and have been extremely impressed with the specifications, performance and overall excellent value for money. 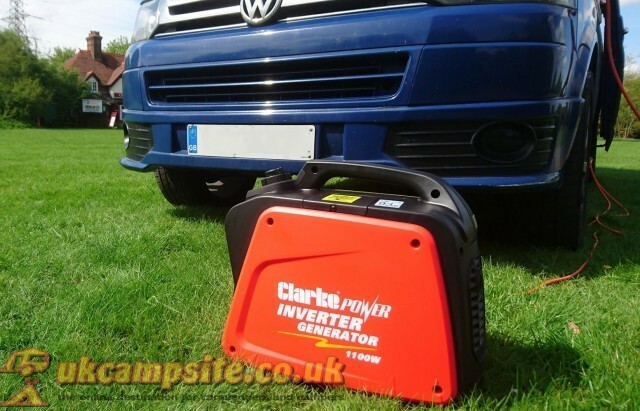 So we were delighted to be asked to review two updated models, the Clarke IG1200B 1.1kW Inverter Generator priced at £299.98 and reviewed below, and the IG2000B 1.8kW Inverter Generator at £419.98 inc VAT . We're expecting great things, as they are very similar to previous models we've recommended, with just some minor changes in order to ensure they comply with the very latest standards. 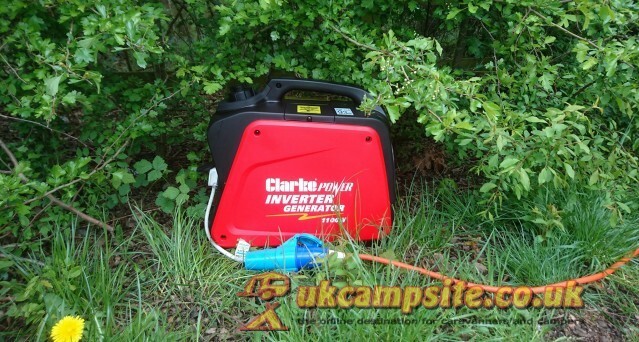 With a lightweight design the Clarke IG1200B generator is ideal for powering sensitive equipment such as laptops & televisions whilst on camp sites, caravanning or just away from home. The Clarke IG1200B generator arrived well packaged with plenty of protection - because the box is substantial you can keep it to store the generator in, and transport it etc if you like. It was very simple to get going, you just must remember to fill it with oil before you do anything else! It uses SAE30 oil which is widely and easily available, and of course you just then need some unleaded petrol to run it. It is based on a 4 stroke petrol engine, which means there's no complication of needing to add oil or lubricant to the fuel, and it means it is quieter than 2 stroke engines. Once we'd filled it, it was time to give it a test, so we took it with us on a planned trip out to a local campsite with no EHU facilities. Because it can provide 12v DC 12V (4A output) as well as 240v AC, it can be used to charge your battery, which came in very handy when our fridge drained our leisure battery (forgot to charge it before we left!) A few hours running during the day was enough to give the battery a good boost. Of course, we usually want a generator to run mains equipment, and this machine includes a standard 230V 13A socket with a maximum power of 1100W, and continuous output of 1000W. It features "sine wave constant voltage technology" which has a frequency stability of +/-1%, this is more stable than the normal mains supply and is therefore ideal for powering sensitive equipment such as computers TVs etc. You can of course use plug your mains lead into the IG1200B with an adapter, and then back to your van to use your built in 240v equipment - ideal if you have a built in battery charger in your van or want to run a mains TV etc. It features an "ECON switch" which means the generator will idle when no power is drawn. With this turned on the engine speed varies according to the load connected, and results in decreased fuel consumption and less noise! This feature should also prolong the lifespan and reduces running costs of this device. The spec states it has a noise level of 91db at 7 metres (1/4 load) and we found it quite acceptable running during the day without disturbing the wildlife or neighbours, just a gentle throb in the background. The fuel tank has a capacity of 3 litres, and at 3/4 load it will run for 5 1/2 hours before you need to think about refilling it. In practice we got a bit longer as the load was lighter, which is great. At 12.4 KG we found it easy to load into the van, and then move it around. Machine Mart may not be the first place you'd think of for camping and caravanning gear, but they stock a great range of camping and caravanning equipment, perfect for campers and caravanners. 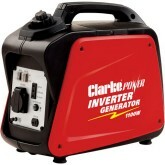 Win a Clarke IG1200B 1.1kW Inverter Generator worth £299.98! We have teamed up with Machine Mart and are offering you the chance to win a Clarke IG1200B 1.1kW Inverter Generator worth £299.98. 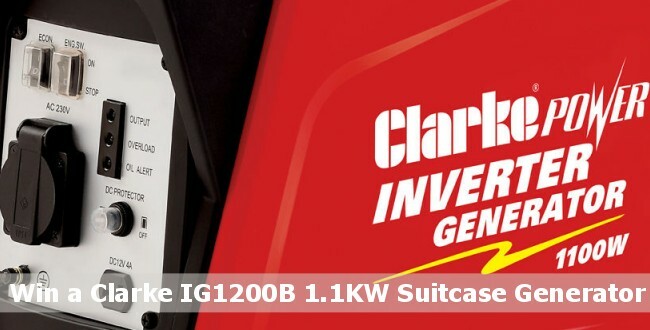 The powerful Clarke IG2000B 1.8kW Suitcase Petrol Inverter Generator from Machine Mart is new for 2018. 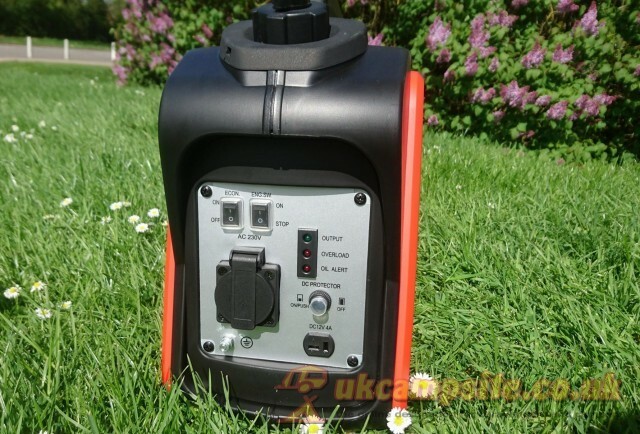 Lightweight and powerful, it is ideal for camping, motorhomes and caravans. Read our review and get a chance to win one!